Please email chris@themakerbean.com for dates and times. Parties last between 2-3 hours which includes the activity instruction, a snack break, and time for play and celebration! 30 minutes is allocated before and after the 2-3 hour window slot for set up and clean up between parties. Guests refers to the children participating in the activity. Parents, guardians and chaperones may join in at no additional cost, though seating may be limited! We have several party themes available for you to choose from! Please browse the themes below to see photos and descriptions. Some party themes are subject to availability on certain dates where our instructors are available. 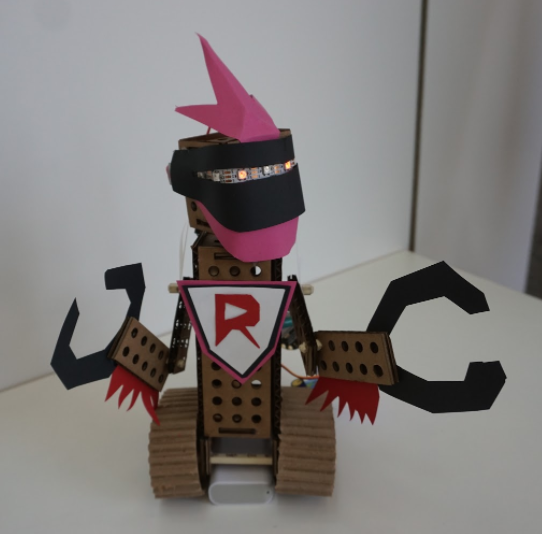 Build your very own robot companion! You supply the imagination, and we supply the robotic parts, building materials, and mentoring to bring your idea to life. Who needs loot bags when each participant gets to bring their new robot home? Each participant will receive an assortment of laser cut robot construction parts, servo motors, control knobs, LEDs and a battery pack. Put them together to make a robot that can swivel its head, move its arms and other appendages you design on command. 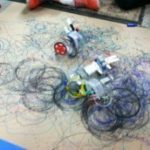 Young Makers get a taste of robotics by building a simple remote controlled bot (two geared motors with wheels and a front caster). 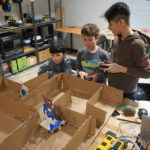 Once the bots are built, Young Makers can either navigate an obstacle course or battle it out in the Ultimate Robot Birthday Battle! No need for loot bags since participants bring home their creations! Young Makers are introduced to simple circuits through designing and making their very own vibrating bot. Markers or paint brushes are then affixed to the bots and spontaneous art is created! Each participant will be able to take their art bots home along with a piece of art they helped to create. 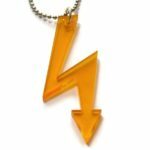 Partygoers will each design their own wearable to be cut on our industrial laser cutter. Choices range from jewelry such as necklaces, charm bracelets and earrings to sunglasses and masks. As always, participants bring their custom creations home. What better way to celebrate your birthday than playing Minecraft with your closest friends? Choose from one of our pre-made worlds and have an adventure together! Each world has a different set of mods included to allow building and exploring in new ways that most kids have not done on their own. You can enhance this party by adding 3D printing or Laser Cutting. 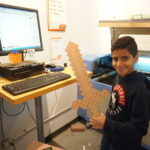 With either of these options, participants will make something in Minecraft, and then we will fabricate it with the 3D printers or our Laser Cutter. Allow an additional half hour for this option in order for us to complete these. Siege engineers of all ages, we need you! 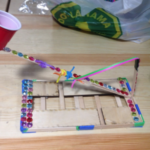 Design and build a catapult using wood, popsicle sticks, rubber bands, and spoons. Use your creation to score points! 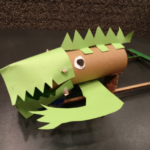 Monster makers will design and make their own articulated monster! After designing their custom monster pieces, we fabricate them on our laser cutter. Heads, jaws, claws, arms, tentacles, and wings are then assembled on our monster framework pieces. The framework lets them make them move using levers and push rods. You can enhance this party by adding 3D printing or Laser Cutting (price increases). With either of these options, participants will make something in Minecraft, and then we will fabricate it with the 3D printers or our Laser Cutter. Allow an additional half hour for this option in order for us to complete these. Once we have confirmed our space and instructors are available for your request, an online booking deposit of $300 + HST must be paid a minimum of 1-2 weeks in advance to reserve the spot. The deposit is subject to our standard cancellation policy (see below). If extra kids are added, payment can be made upon final confirmation email on the Monday before your party when the remaining balance for the party will be charged. STEAMLabs reserves the right to follow up with additional charges that were incurred on the day of the party after the event through your online account. No refunds for extra guest bookings or guests who do not show up on the day off. To book, please email us at chris@themakerbean.com. We will follow up to confirm within 48 hours and confirm any questions and details about your request. Once we are good to go we will send you an online booking contract and deposit in advance to hold the spot. If you have any questions please check out our FAQ below. All pricing includes two instructor/mentors during activity time, some laptop equipment, and required materials for participants to bring their creations home! Can we come and visit your venue? Absolutely! The best way to do so is to please email chris@themakerbean.com to see when we are available and a designated community animator can take you through our space and answer basic questions about our facilities. Do you provide food and catering? Yes, we’d be happy to provide you with a catering menu for food, snacks & beverages. If you are bringing your own food, please ensure to bring your own tablecloths, napkins, cutlery, plates, etc. What if we forgot something at the party? Do you have a lost and found? Booking hosts are responsible for ensuring their party guests leave with all of their belongings and their party souvenirs and staff will do everything possible to support in the reunion of lost articles! Any activity projects or souvenirs left behind after the party may be set aside or dropped at a lost and found bin to be picked up at a later date. STEAMLabs staff will not be held responsible for lost items disposed after the clean up window. Do you do birthday parties at the child’s house? At the moment we do not offer mobile parties. All of our parties are run at either our downtown makerspace (192 Spadina Ave) or the The Maker Bean Cafe location (1052 Bloor St. W). Please specify your location preference in your booking request. Can you hold a time / date for us? Putting in a booking request does not guarantee a spot is held. We only hold the time as soon as we receive the contract agreement and deposit. You can change your party time / date later (subject to availability). What if I need to add guests or want to make changes to my reservation? All changes in guest list, add-ons, upgrades, and other accommodations are due in writing by the Monday before your party at 5pm Eastern Time. All written requests can be sent to chris@themakerbean.com and a staff member will reply with a confirmation. Once a confirmation has been sent regarding add-ons and upgrades, there are no refunds if you end up with a smaller group than expected. Late requests after this deadline may be accommodated but are subject to staff capacity and space availability and will be confirmed by the General Manager or his/her designate as far in advance as possible. Can the participants take their projects home? Absolutely! All of our party packages include all the material fees for each chosen activity, which means that all of your guests take home everything they build during the party. Do you have any age restrictions for participants? Guests and party participants that are under 6 years old at the time of the event may attend and participate in the activity but you understand that they must have designated adult supervision from someone over 18 years old from your party (no additional cost for your chaperones). STEAMLabs will not be held responsible to monitor party guests with activities under 6 years old. Can parents, guardians, and caregivers come to the party? Is there an additional fee? Yes you are welcome to join in on the party! There are no additional fees for chaperones – in fact, please check our age restrictions to ensure you arrange adult supervision for children under 6 years at all times during the birthday activity. What happens if we stay past our party booking? If you want more time outside of the standard booking, you can add on more time for activities or just free time to play or have cake and snacks (pending space availability and no other bookings). We space out party bookings so there is 30 minutes of clean up and set up time prior to the next booking. Extra charges may be applied for unconfirmed overstays that run into other bookings ($30/each extra 15 min). When should we arrive for the party? Do we have time to set up? Please arrive up to 30 minutes before your party to set up, get checked in, ensure waivers are set up for each guest, etc. What is provided during the party? Each party package includes two instructors / mentors to facilitate the activity, the space booking for your guests (area of the lab to be determined based on guest list size and availability), and all materials! Decoration and food are not provided but you are welcome to bring it in as long as you clean up within 30 minutes after the party booking. Are there other participants in the space during parties? 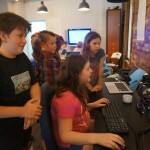 STEAMLabs is a mixed use community makerspace and there are several other programs and parties going on as well as our members co-working in the space at any given time. You will be allocated a designated space for the party. If you are interested in a private booking for full access of the space you can email chris@themakerbean.com to see if there is availability. Generally for kids parties it is understood that the booking does not guarantee exclusive use of the space and that there may be other things going on in the space during your party. Our space is wheelchair accessible and we will make accommodations to ensure you and your guests’ accessibility needs are considered as much as possible! Please let us know in advance if you may require accessibility accommodations so we are aware in advance. For party booking deposits we accept credit card only. We hold the credit card information only for the purposes of processing the final payment following the deposit. Please ensure there are sufficient funds for final charges. Additional charges may apply for multiple failed transactions. In special circumstances, we may accept other forms of final payment but these must be arranged and confirmed with the General Manager in writing in advance. Receipts will be submitted to the email associated with your online account on file. There will be no refunds for guests who do not show up after a confirmation has already been made about final guest numbers.